Verify the semantic consistency of systems described using safe subsets of heterogeneous modeling languages, ranging from behavioural to architectural languages and presenting a synchronous and asynchronous semantics (Simulink/Matlab, Scicos, Xcos, SysML, MARTE, UML). Generate optimized source code for multiple programming (Ada, C/C++) and syntesis (VHDL, SystemC) languages. Support a multi-domain (avionics, space, and automotive) certification process by providing open qualification material. Project P is a three-years research projects funded within the French FUI 2011 funding framework. It sees the collaboration of major industrial partners (Airbus, Astrium, Continental, Rockwell Collins, Safran, Thales), SMEs (AdaCore, Altair, Scilab Enterprise, STI), service companies (ACG, Aboard Engineering, Atos Origins) and research centers (CNRS, ENPC, INRIA, ONERA). 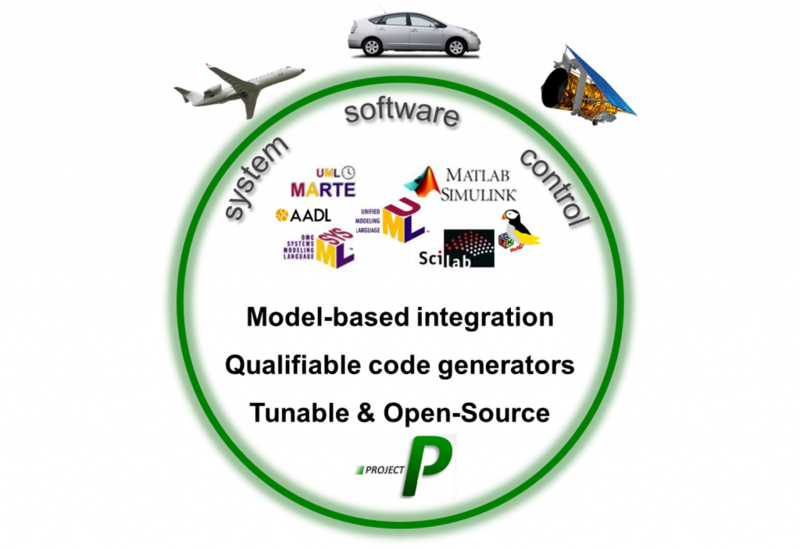 The following presentations summarizes the main goals and results of Project P. It was first presented in June 16th, 2015, during the final Project P Open Workshop. The intermediate metamodel at the heart of the P Toolset - the P formalism - is available under an Apache license here. Down below, you can find some videos showing the main products and technologies developed during Project P.
In this video, we show how to use QGen to generate code from Simulink models using different code generation strategies. In this video, we show how to use QGen and SynDEx to perform real-time schedulability analysis and generate a self-contained distributed kernel for a specific application. In this video, we show how to use QGen to generate code from XCos models. In this video, we show how to use QGen to generate VHDL code. In this video, we show how to use QGen to generate code from Scicos Pro models. In this video, we show how to use QGen to look for bugs, in particular potential divisions by zero, in Simulink models. In this video, we show how to use QGen to detect redundant modeling elements, i.e. redundant calculations that are "hidden" by other calculations. In this video, we show how to use QGen to formally prove properties on Simulink models using Simulink assertion blocks.